I remember genuinely adoring catch-22, and I should revisit to stress-test my memory and nostalgia. Management books are the worst. A couple of stories from friends are way better at reminding me what people need and want from managers. Sorry you’ve been tortured thus. The research I’ve seen says purple is the least favorite color on average. So it’s not your fault this shelf is sparse—publishers don’t want we a lot of purple because of all those heathen who select based on binding and buy based on cover. 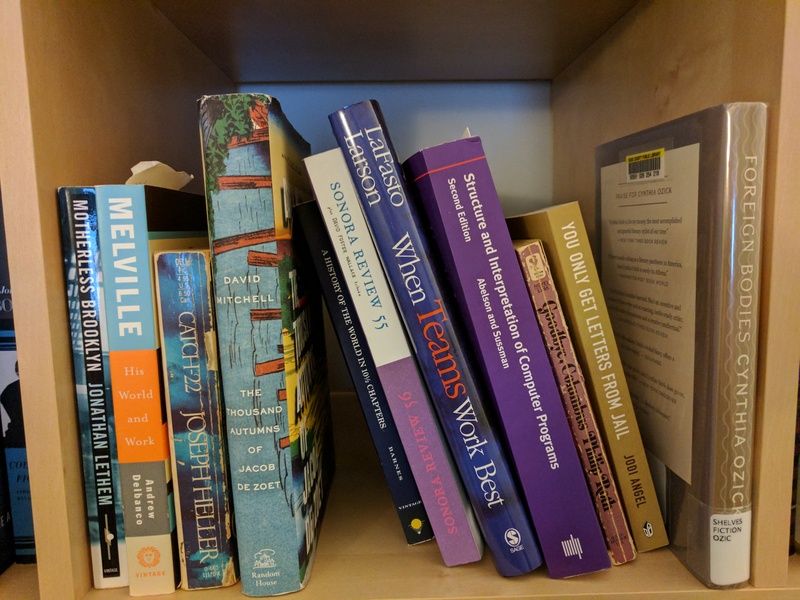 You retain books for connection, and the odds of having a robust purple shelf are really low. I’ll look into this Mitchell, because I want to like him, and think he has a good ear and good sense of character. I could just live without the cyclical and epic reincarnation and mystical connection stuff. I still want to hear about your anger/frustration with The Bone Clocks. Not that I love it, but it paced a good dozen long runs (or so) as an audio text. I agree that Mitchell often has a really good ear, and I could see much of Bone Clocks playing pretty well as an audio book while like driving or slogging to work on the train. As something to sit down and focus on, though, a lot of it is horrible, just awkward and ham-handed. I had a similar feeling about Stephenson’s REAMDE. I have kind of an uneven relationship with Stephenson too (I liked Snow Crash and Cryptonomicon but what I could wade through of the Baroque Cycle seemed like garbage, as did REAMDE, which would probably have mostly played pretty well as a 2.5-hour movie with all the edits that a screenplay tends to include, but as a book to sit down and spend like 25 – 30 hours reading, well, I wish he’d made it a 15-hour book of much higher consistency and quality.